Despite the fact that piranha's - undeservedly so - have a bad reputation of being mindless, bloodthirsty killers, they are quite popular 'pets' and an ever increasing of people keep them at home in their aquariums. And it must be said: piranha's, being tough and hardy fish, are by far not the most difficult or even dangerous fish to take care of, as long as you take note of a few simple basic rules, which will be outlined on this page. The most common species, which most of us have seen in either in a pet store, public aquarium or zoo, is the Redbellied piranha (Pygocentrus nattereri). Somewhat paradoxically, this species is one of the few members of the piranha family which is considered potentially dangerous to men (together with the in the aquarium trade much more rare Pygocentrus cariba and Pygocentrus piraya - these are the three species of 'True' Piranha's, that in the wild live in huge shoals of often hundreds of fish). Other fairly widespread species are the Pacu's (genus Colossoma), Silver Dollars (genera Metynnis, Myleus and Mylossoma), the Rhombeus Piranha (Serrasalmus rhombeus) and the Maculatus Piranha (Serrasalmus maculatus). With exception of the latter two, these fish are predominantly herbivorous (ie. plant eaters), but for that very reason many consider them to be not as attractive or desirable as their infamous carnivorous relatives. Something that many people don't realize is that many species can grow to pretty large sizes, especially when one compares them with popular and more known freshwater community fish such as Tetras, Barbs, Apistogramma Cichlids or Corydoras Catfish. This gap in knowledge is further complicated by the fact that many of the piranha's sold in stores are little, if at all, larger than those fish, in combination with a lack of proper education and preparation by the selling party. And that can pose rather obvious, but to the owners often overlooked problems, problems that in usually go at the expense of the fish: most species can reach a size of at least 8-10", but the largest species (Pygocentrus piraya and Serrasalmus manueli) may grow up to as much 2 feet, so a very large tank is an absolute necessity regardless of what species you intend to keep! The exact size of the tank piranha's should be kept depends on the species, and often is a matter of heated debate amongst piranha enthousiasts. A common rule of thumb is at least 20 gallon (80 liter) per adult fish for Pygocentrus species, and for the smaller solitary Serrasalmus species at least a 40-48" (100-120cm.) long tank. All Pygocentrus species are shoaling fish by nature, which means that they should be kept with more than one in a tank. Most experienced keepers of shoaling species will confirm that a single Pygocentrus will not be a lot of fun, not only because it is likely to remain shy and reclusive throughout its entire life and will hide all day except during feeding time, but also because it will show little to no natural behavior whatsoever. Two fish will also result in failure most of the time, because eventually they will turn against each other trying to establish dominance, and will often fight until one is killed. Even though there are exceptions to this, most piranha keepers will recommend three or more Pygocentrus. But there are no iron laws when it comes to keeping piranha's, which is demonstrated by various reports from Pygocentrus-owners: some recommend far more than 100 liters per fish, and others keep 8 or 10 healthy adult Redbellies in a 100 gallon (400 liter) tank... Important to remember is this: if your tank is cramped, you can expect stressed and unhealthy fish, and probably some casualties as well, due to disease and stress, aggression and territorial disputes. The more tank space your fish will have, the more comfortable and lively they will be. And piranha's, no matter what size or species, look best in a very large and natural looking tank to begin with. Serrasalmus piranha's are a different story: most species must be kept solitary, because they are very aggressive and intolerant and will most likely kill every other fish that enters their tank, whether from the same species or not. Some will even attack their keeper when (s)he approaches the tank, their own reflection and even aquarium hardware inside the tank (heaters, powerheads!) in not always safe. 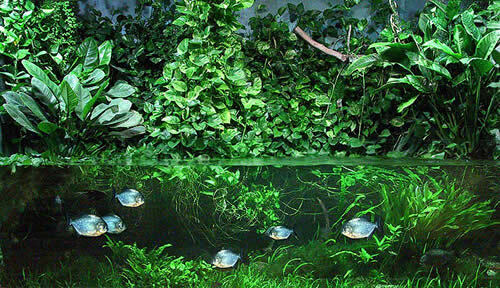 A few species have been kept with more than one, like the Maculatus Piranha, Spilopleura Piranha and Geryi Piranha, but there is no guarantee it will work out: a very large tank, enough hiding places and a very strict feeding regime are an absolute necessity to even have a chance to succeed. Recommendations only! These fish can live in less spaceous tanks, but this is what I believe to be the minimum space to keep them healthy. Before starting with piranha's as pets, you should think about the reasons why you want to take of them. If the sole reason for keeping piranha's is their legendary reputation of being bloodthirsty and ruthless killers, you for sure will be very disappointed. In reality, piranha's are nervous, shy and easy to frighten animals, and they will never be able to live up to their reputation in a home aquarium. In short, if carnage and the massacre of feeder animals are the main reasons for getting piranha's: don't buy piranha's !!! Some people say that after goldfish, piranha's are the most abused aquatic pets, and, after hearing many stories from disappointed piranha keepers, unfortunately there is no denying this. If, on the other hand, you decide to keep piranha's because you want to learn about them, observe them, and appreciate them for what they really are, you will not regret it. Piranha's are very fascinating animals with many surprising aspects and full of personality, even though they are not what most people think they are.... I admit, it is very entertaining and impressive to see piranha's feed (especially on live animals), but if that would be the only reason for getting them, do yourself a favor, and don't! When you are prepared to give piranha's the care and attention they need (and deserve), the first step will be selecting the piranha's you want. Before purchasing them, however, be sure your newly set-up tank is ready to house them (i.e. it is properly furnished, equipped and cycled; see below). Most people start with the common Red Bellied Piranha (Pygocentrus nattereri), because they are the easiest species to keep, most readily available and very cheap compared to the rare, imported species: 1-2" specimens are readily available for about 4-8 dollar, as well as 3-4" fish for around $10-20,- (these are local prices, though: they may vary from place to place, and from time to time). With some luck, you might even find more exotic species like Serrasalmus Rhombeus or Serrasalmus maculatus you in the better equipped pet stores. When setting up a piranha tank, the first thing you should be sure is that you have enough space to place them in, preferably a quiet corner somewhere (for people who want their piranha's to be very aggressive, but stressed: do the opposite!!!). Baby piranha's can - temporarily - be housed in a relatively small tank (15-30 gallons or 60-120 liter, depending on the species and number of fish) to raise them to a certain length, but youngsters grow very fast (Pygocentrus piranha's in particular), and when they are about seven to nine months old they measure about 4-6" (10-15cm.) in length, and should be moved to a larger tank. Piranha's are very tough fish, and moving them from one tank into another will in most cases cause not too much stress, even though the water conditions (temperature, pH and other water perimeters; I will discuss optimal circumstances later) might be quite different. The best thing to do is to make good preparations, perform a few water tests and have your aquarium fully furnished and planted before introducing the piranha's, so that water conditions are at best and no stressful major refurbishing has to be done once the fish are introduced. Putting back uprooted plants or moving a piece of wood or rock a little will not stress out your fish (although they might freak out), but renovating the interior on a regular basis will put strain on your beloved predators. The first thing to do is preparing your tank to make it inhabitable for fish. For (all) fish, to survive and thrive in a tank, a certain chemical and biological balance has to be achieved. To create this balance, the tank has to be cycled, or in other words: the nitrogen cycle needs to be established. This nitrogen cycle goes as followed: ammonia => nitrite => nitrate (see illustration). First, you place the substrate in the tank, and fill the tank with water. Depending on where you live, the water may contain chemicals that are dangerous to fish, like chlorine, chloramine and metals. If so, the water needs to be treated first. Besides that, the pH and hardness of the water has to be changed according to the fish you want to keep (fish from the Amazon region, for example, prefer soft, acidic water, and African Cichlids need hard, alkaline water). After that, the 'aquatic hardware', like filters and heaters should be installed, and started. After a few days, you can add the first plants (very useful for a healthy tank environment, since they transform CO2 into oxygen, a welcome and beneficial addition to the normal gas exchange between water and air at the surface). Some days later a couple of cheap (feeder) fish (like goldfish or minnows) should be released in the tank. Heavy feeding is not necessary. The fish's waste, containing ammonia (a chemical substance very dangerous to fish which, in high levels, can cause severe 'ammonia burns' and damaged gills) will kick start the growth of the ammonia-consuming bacteria. These useful bacteria will feed themselves on the ammonia, and release nitrites into the water as a waste product. Nitrites is also very harmful to fish, but are taken care of by other bacteria that transform it into less dangerous nitrate. The start of these chemical processes can be accelerated by adding bacteria cultures (or even pure ammonia), fish flakes or more fish to the tank water and to the filter media, but this is not necessary, since it will happen naturally between 3 to 6 weeks, depending on the tank's size. The final stage in the chemical cycle is doing water changes: this will remove the nitrates from the water. To keep track of the 'birth' of this cycle, perform water tests on regular intervals to see if the water perimeters are going into the right direction. Tip: The cycling process can be shortened considerably when you use filter media and, to a lesser extent, gravel and decor from an already established tank. The next couple of paragraphs are about how to set up the tank. Piranha's are large and powerful predatory fish, but also have a skittish and nervous character, and therefore the tank must be set up accordingly. Of course, the final aquascaping should be done before the fish are released into their new home, to minimize stress. The next thing I want to discuss is the aquascaping of a piranha tank. Despite their fearsome reputation, piranha's are very skittish and shy fish: they panic easily and sometimes without apparent reason, and this could harm them when hiding next to the heater or slamming into rocks or other sharp objects. For example: in fear, one of my own Redbellies once hid behind a heater when I had to replant an uprooted plant. This gave him a couple of nasty heater burns (see picture to the right), which fully healed after 2 months however. What I am trying to point out here is: because piranha's are nervous and frighten easily, accidents can happen. Most of the time the fish will recover fully, but try to minimize the risks for your piranha's wellbeing. For bog wood or driftwood there are some points to consider as well: before placing it into your tank, it must be boiled and cleaned thoroughly until all tanic acids have leached out. Especially when you plan to use wood found outside, be sure it is cleaned well, and that no resin, dirt etc. remains. Pieces of wood and rock are important for piranha's, because they provide places to shelter and make the environment more natural. Piranha's (or at least species from the genus Pygocentrus) are territorial fish, and big Ed has taken residence under a piece of bog wood; it is an ideal place for him to check out what happens in his surroundings inside the tank as well as outside of it. My point is: provide shelters, and your piranha's will be more at ease and eventually will become more daring and adventurous. A very important thing to consider when setting up your tank is that, because piranha's are such ferocious (and messy!) eaters, lots of waste and pieces of food will stack up in the substrate. Waste will release harmful ammonia into your tank, and besides that, decaying food will deprive your aquarium of oxygen. A very powerful and efficient external (canister) filter or an sump is an absolute necessity to deal with chemicals dissolved in the water: the biological filter must be powerful enough to filter a tank of at least 1,5 times the size of the piranha tank, better 2 times (in other words, for a 100 gallon piranha aquarium, you'll need a filter rated for 150 gallons, but preferably 200 gallons). Reliable and efficient external filters are made by Eheim, Fluval, Magnum and AquaClear. Besides that, an additional internal filter, mainly for mechanical filtration (ie. removing floating pieces of debris, like dead plants) can be added to the tank. Another useful device is a powerhead to create currents: most piranha's love to swim in it, and it is good for their growth rate, because the exercise speeds up their metabolism. Finally, an air pump will oxygenates the water and maximizes surface gas exchange between air and water (CO2 vs. oxygen), because it makes the water surface area larger. Another useful way to keep your water perimeters in check is using living plants instead of fake plants (or none at all). Plants will absorb (harmful) chemicals like CO2 and nitrates, and help oxygenating the tank water during daytime (at night they do not absorb CO2, but instead release it). Another reason why live plants are useful is that they use up all the available nutrients in the water, depriving any algae from a food source. Besides that, a nicely planted tank looks more natural than a very sterile tank, but of course that's a matter of personal preference. Your fish will appreciate it, though. Piranha's do not like very bright light, because it makes them feel vulnerable, and some even say it is harmful to their eyes, since they do not possess eyelids to protect their eyes or retractable pupils to adjust their eyes to different light conditions. And in their natural habitat, the water is often very murky or mostly shaded by overhanging plants. The amount of light is of course determined by the tank size, but in general, one standard, 36 Watt tube light will be sufficient for a small to medium-sized tank (up to 80 gallon), two tubes for larger tanks. You could even consider using no artificial light whatsoever, but than make sure the tank is placed in a bright place, because plants need light to grow and transform harmful chemicals (like nitrates) in the water into oxygen. But when your tank is standing in full sun light, it can cause an explosive growth of all kinds of algae, with all the nasty consequences that accompany this. A good compromise is using tube light for the plants and floating plants to provide shaded areas. Dimming the light with sheets of paper, tinfoil etc. or painting or wrapping the light tubes to dim them, are suitable solutions as well. Finally, an arched piece of wood, a rocky cave or a flower pot, under which the fish can shelter, will also do the trick. Piranha's are very tough fish that can adapt to various water conditions and even survive in very dirty water, but it's (of course) best to provide them optimal water conditions. The temperature of the tank water should be between 76-82° F (24-28° C), the pH ranging between 6.0 and 7.5. In their home range (tropical Southamerican rivers) the water is fairly oxygen-poor, soft and acidic, because of decaying plants and slow water current. This condition can be simulated by running the tank water over peat (to be placed inside a filter) or black water extract, which you can buy at most pet stores. But this is absolutely no necessity!!! Setting up an aquarium for piranha's is not as hard as it might seem, and as long as you observe a few rules, you can make your piranha's feel at home without too much effort. The most important thing when decorating the environment were your beloved killers have to house for many years: listen to what other, experienced piranha keepers have to say and use common sense, and of course, your imagination!!! It is very important to watch your newly introduced fish closely the first days and weeks. All the hassle concerning transporting (many piranha's, especially the rarer species, are wild-caught, and shipped over long distances), moving into a new tank and acclimatizing, can take a heavy toll from them. The stress from being transported (especially with shipped fish, which are often tranquilized and kept in small boxes for many hours), the relative sudden change from transport water to tank water (no matter how gradually you introduce the fish) and the completely strange and bewildering environment they suddenly find themselves in, must be a terrifying experience. So monitor their adjustment and acclimatization to their new home closely. Within a few days (or weeks, in extreme cases), they must start to explore their new home, no matter how careful they probably are, and accept some food. When they remain passive or even lethargic, and/or refuse to eat, inform what is the best thing to do, whether at a local pet store or on discussion boards on the Internet (see the link-section). When the piranha's have acclimatized to their tank, you might consider adding some other fish in their tank. The question in how far piranha's can be kept together with non-piranha species is a much debated subject. Some argue that it is impossible to do, others have successfully mixed their piranha's with a variety of other fish species. I think it is all a matter of how large the tank is, in which way it is aquascaped, the amount of piranha's, what species of piranha, their attitude and character, how well-fed they are etc. Personally, I do think that it is possible to mix certain species of piranha (ie. Pygocentrus-species, Redbellied Piranha's in particular) with other fish, as long as they can defend or hide themselves and the piranha's are well fed. I used to have six, later five adult Redbellies of about 8-9" (20-23cm.) in length, and they share their tank with a wide range of different species, including Plecos, Corydoras, Neon and other Tetra's and small Barb-species. Occasionally, one of them is eaten by the piranha's, but after frequently visiting piranha discussion boards I realized that my situation appears to be an exception rather than the norm. 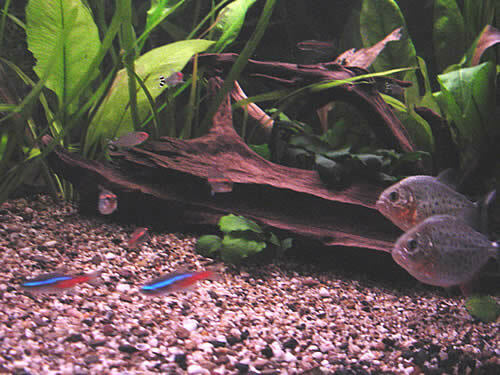 Some of the Barbs, placed in the tank as feeder fish initially, have coexisted with the piranha's for years! This is my personal experience, but there are numerous stories from piranha-owners who are unable to have their piranha's live together with any other animal. Many will say that the more aggressive species, like S. Rhombeus and S. Elongatus (in fact, most of the solitary Serrasalmus-species) are virtually impossible to mix with other fish, their own species included! Others, like the Wimpel Piranha and other aggressive scale eating and fin-nipping species, can only be kept with strong species larger than themselves, because they eat fins and scales, and can damage a fish so bad it eventually perishes. Omnivorous relatives on the other hand, like Silver Dollars and Pacus can be kept together with a variety of other fish, including small Tetras, Barbs etc, although Pacu's do eat smaller fish on rare occasions. I have noticed that the most common fish accompanying piranha's are pleco's. It is a useful bottom dwelling fish, because it is an active scavenger that cleans up the bottom of the tank. Besides being useful, are pleco's very strong fish, because of their armor plates, and their ability to withstand very poor water conditions. This makes them more resistant to piranha bites and the waste produced by the predators (fish waste, rotting food). They hold their ground against too obtrusive piranha's by hitting them with their powerful tail or bumping into them, but many have died by the 'hands' of piranha's as well. Personally, I highly recommend this fish for being a very useful and hardy companion for your piranha's, but it's important to buy your pleco together with the piranha's, or buy a larger one once you decide to do it in a later stage of your hobby. Other animals that can help keeping your substrate tidy are talking catfish (because they are nocturnal and hide out of reach), crayfish and crabs (very vulnerable when molting, so provide enough hiding places) and snails. They all do a good job, but results vary, ranging from successful to almost instant death..... Piranha's are opportunistic predators, and you simply cannot know how they will react to other animals in their tank. It's not uncommon with piranha's that they kill a tank mate that has lived with them for several months. When you finally have your tank furnished, running and populated, it's time to sit back, relax and enjoy the fruits of your labor. The most laborious part of the aquarium hobby, setting up a tank, is now a thing of the past, but that does not mean you can sit back and let he fish fend for themselves. A tank has to be maintained properly to keep its inhabitants healthy and happy. But tank maintenance is not as laborious as it may sound: depending on its size and inhabitants, it averages about one to two hour a week, although most piranha keepers spend a lot more time on taking care of their fish. When keeping piranha's, the most important thing is to keep the water clean. You should run water tests every so many days or weeks. Changing about 20-25% of the tank water every week is an absolute necessity, but around 50% every week is recommended in order to keep the fish healthy and growing/developing without incident. Changing too much water (more than 75%, in my opinion) is not recommended though, because it may cause the water perimeters to change very abruptly, which may kill or disease the fish. Furthermore, make sure that you always remove uneaten food items and dead plants, vacuum the bottom of the tank every once in a while, using a battery-operated aquarium cleaner, python system or a piece of filter hose, to get rid of waste. The filtration system should be cleaned every few months: a general rule of thumb cleaning it as soon as the filter throughput starts to decrease, but this is not the safest rule. Performing water tests is a more reliable manner: when peaks occur (more frequently), it is time to clean/refresh the filter media. When cleaning a filter, be careful not to clean the filter media containing the nitrifying bacteria too much (they must be kept in warm water, preferably flowing water, to maintain a steady flow of oxygen and nutrients), because you can easily kill the bacteria that inhabit the media. In a worst case scenario, your tank might become inhabitable for fish and has to be cycled again. The best way is rinsing half of it with warm (not hot!) water, and the rest a month or so later. The media containing the bacteria must remain wet as well: the bacteria die after they are out of the water for about 10 minutes. Filter media (like active carbon, zeolite, media bags, peat pellets or peat moss) and filter pads can be washed out every time you clean your filter, and replaced every third filter cleaning session. 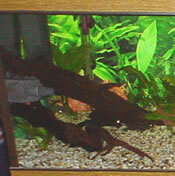 Additionally, undesired algae growth needs to be removed from the aquarium: the tank walls can be cleaned with a magnetic algae scraper, pieces of decor can be brushed clean with a tooth brush or something similar (preferably outside the aquarium), and plants leafs can be rubbed clean with your fingers. Probably unnecessary to mention: never ever use chemical cleaning products! And in my opinion the most important (and enjoyable!) of it all: observe, observe, observe! The more you watch your fish, the more you will learn about them and their behavior and needs, and the easier it is to spot irregularities or problems in an early stage. By constant close observation, your ever-increasing knowledge of your fish will allow you more time to take appropriate and effective measures (and this ground rule applies not only to piranha's, but to all aquarium fish, and in fact all pet animals). What species of piranha are most suitable for a home aquarium? 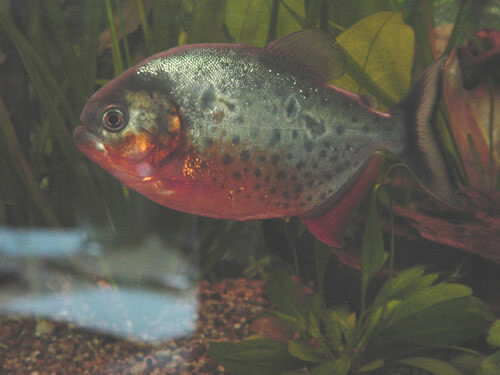 Most people that keep piranha's started with Red Bellied Piranha's (P. nattereri). They are the cheapest, most readily available, least demanding, and in general the least aggressive species. The other Pygocentrus species are somewhat harder to keep, because of their rarity: most Cariba are wild-caught (first successful breeding attempts took place in 2003) and for that reason quite expensive, compared to Redbellies. P. piraya has not been bred in captivity yet: for that reason, and its potentially very large size, they are very expensive. Both species have special demands, which makes taking care of them more tricky than P. nattereri: Cariba are known for their insatiable appetite and territorial aggression, and Piraya demand a very good water quality to thrive. Besides that, Piraya seems to be the most unpredicatble of the three: seemingly random killing sprees in so far perfectly coexisting shoals have happened on more than one occasion. Most Serrasalmus piranha's are highly aggressive, and therefore not recommended for beginners. Because most species do not tolerate companions in their tank, they are not as attractive as the shoaling Pygocentrus species to many people. Also, most species are all quite rare, because only wildcaught, making them rather expensive. And finally, being wild-caught fish, it can be very hard to get them to accept prepared food items. For the same reason, they do not tolerate bad water quality as good as Redbellies or S. spilopleura. The two most suitable species for piranha beginners are S. rhombeus and S. spilopleura/maculatus: the first species because it is widely available at many sizes for a reasonable price, and the latter because both has been bred in captivity on a fairly large scale, increasing their availability, and decreasing the price level. What tank size do I need to keep piranha's? The answer to this question depends on the amount and species of piranha you want to keep. For the shoaling pygocentrus species (nattereri, cariba and piraya), juvenile fish can be kept at a rate of about 10 gallons per fish. When they get larger (4-6 inches), depending on how well they get along as a shoal, they should be moved to a tank that provides at least 15, preferably 20 gallons or more per fish. Adult P. piraya require even more space, because of its very large potential size. For piranha's from the genus Serrasalmus it is a somewhat different story. Most species can only be kept solitarily, because they will not tolerate other fish in their tank. Most smaller species (like S. altuvei, S. spilopleura or S. brandtii) can be kept in a 45 gallon tank for life, since they will rarely exceed 10 inches in length, although a 55 or bigger gallon tank is a better option. Adult S. elongatus, a very fast and agile swimmer and a very active species, will need at least a 55 gallon tank, but preferably a 75 gallon or larger. Adult specimen of the larger species, like S. rhombeus and S. manueli, need larger tanks to make them feel comfortable. Finally, under certain circumstances, some of the Serrasalmus species can be kept in groups, like S. geryi, S. spilopleura and S. denticulata, although there is no guarantee it will work out, because of their generally intolerant and fin-nipping behavior. These species do not grow to very large size (maximum about 10 inches), and at least 25 gallons per fish is needed, although aggression levels may be decreased in a larger tank. How should I set up a tank suitable for piranha's? First, piranha's are skittish animals, so they should have the opportunity to hide. Pieces of bog wood, rocks, (live) plants, flower pots, artificial caves etc. are very suitable to create hiding places. Secondly, the substrate should not be too coarse, because dead plants and food remains may get stuck between it and start decaying. This is very bad for the water quality, because rotting plants and food remains increase the amount of ammonia in the water, which in turn causes spikes in nitrites. Both chemicals are very harmful to fish. Thirdly, the process of decaying deprives the tank water from oxygen. Another thing to keep in mind is that piranha's do not like bright light. In most cases, a single tube light is sufficient. Another option is to keep the lights dimmed, either by wrapping the tube light with aluminum foil or colored plastic (like a candy cane), or by placing sheets of paper between the lights and the water surface. Fourthly, there should be enough filtration, because piranha's are such messy eaters and excrete a lot of waste. The minimum amount of filtration is about 4-5 times the tank gallonage per hour, better is 8-10 or more times per hour. One last tip: there is no such thing as too much filtration, so don't save money on filters when you set up a tank for piranha's!!! What can I do to make my piranha's less skittish? To make piranha's less skittish, there are a number of things you could do. Raising the water temperature makes your fish become more active and aggressive. Besides that, provide enough places to hide. This makes them feel more at ease, and eventually they appear more often, and will not dart away as soon as you approach the tank. Furthermore, placing the tank in a high traffic area makes piranha's grow accustomed to humans faster. And this makes them less skittish, since they are used to having people around them. My piranha's are very aggressive towards each other. What can I do? Aggression is often caused by stress, or overcrowding. The more 'personal' space piranha's have, the more room each fish has for its own little territory, and the less aggressive they are. Offering a couple of places to hide can reduce aggression as well: less dominant fish are able to retreat from the 'daily grind' for a while. Besides that, a high water temperature increases piranha aggression, so lowering the temperature a couple of degrees may be a solution as well. Finally, well-fed piranha's tend to be not as aggressive as hungry ones. One of my piranha's is injured! What to do? It depends on the degree of injury. Fin nips and minor bites will heal quickly, and do not require special measures, although you could raise the water temperature slightly and some a bit of aquarium salt to the water to speed up the healing process. More severe bite wounds can become infected, and the injured fish might be seen as weakened by its tank mates and killed. Therefore it is wise to place this fish in a hospital tank, with warmer water than normal (about 82-84 degrees F) and with 1 tablespoon of salt per 5-10 gallons of water added. What is the best diet for my piranha's, and how often should I feed them? It should not contain any chemical additions like preservatives, color- and flavor enhancers, spices and so on. These unnatural additions can be potentially fatal to fish. The food items should not contain too much fat (applies in particular to mammal and beef heart), because it can cause digestive problems, especially with younger piranha's. Therefore, it should be fed occasionally, and with moderation. Live foods like feeder fish or frogs can contain potentially dangerous parasites and diseases. Amphibians can even be poisonous, so caution is advised. Many people that choose to feed feeder fish quarantine them before feeding them, and many others choose not to feed life foods at all, despite the excitement feeding it causes. Besides that, feeders aren't very nutritious, because they lack certain nutrients. As an addition to their diet, it's a decent choice, but it should never be more than an occasional supplement to their diet! Very nutricious are home-made food cubes: blend fish, shrimp, meat, vegetable matter, vitamins, food supplements etc. combined with gelatine and freeze it into bitesized cubes. With a bit of luck and perseverance, you can get your piranha's to accept pellet foods: they are high in nutrients, vitamins and other healthy additions they usually don't get from other food sources. Krill, shrimp and color-enhancing pellets are very good to bring out the coloration. Most important when feeding your piranha's is offering them a diverse diet: as with humans, variety is the spice of life. Also, avoid overfeeding. When young, piranha's can be fed small portions twice or three times per day, so they can develop properly. Once they get bigger, decrease the amounts of feedings per day, and once they are adults, feeding them once every 2-4 days is enough (healthy adults can easily go without food for a week). Feeding too much can cause obesity, sluggish fish and fish that are more vulnerable to diseases and parasites. So, always feed with moderation, and take out uneaten food within an one or two hours. My piranha's swim up to the surface and swallow air. Why is that? This sort of behavior can indicate a number of things. First of all, piranha's swallow air after they have been feeding. Because the body has become heavier, they swallow air to compensate the extra weight and this prevents them from sinking to the bottom. Besides that, the tank water may be of bad quality or contain very little oxygen. If the quality of the tank water its bad, check the water perimeters, treat the water if necessary, and perform a large water change to see if this helps. If there is not enough oxygen in the tank, add some live plants, an air stone or a little filter or powerhead to create surface agitation, thus increasing the surface gas exchange (CO2 vs. oxygen). My piranha's are rubbing against objects or the tank wall. Why? Most, if not all, piranha keepers will notice this sort of behavior. In most cases there is nothing to be worried about: they just do it to get rid of a nasty itch, just like humans scratch when they have an itch. But when they do it very frequently, the fish might be sick or the water quality might be bad. In the first case, treat the fish affected like any other fish with ich (Ichthyophthirius multifilis) by increasing the water temperature a couple of degrees and adding one table spoon of salt per 5-10 gallons of tank water. In the second case, check the water perimeters and treat the water if necessary. Also perform a rather large water change to purify the tank water. against a piece of drift wood. Can other animals live with piranha's? Many people keep Pleco's or other hardy catfish with their piranha's to clean up food remains. These fish can live with piranha's for a long time, but there's always a chance they get killed for no apparent reason. The same applies to Crayfish and Freshwater Crabs. These animals are extremely vulnerable during their molting phases, so enough places to hide are necessary to give them a change. Other fish that can live piranha's are members from the life bearing fish family (ie. Guppies, Mollies, Swordtails etc. ), Neon and other Tetras, Barbs and Danio's, smaller Cichlids etc. These fish should either be too small to be bothered, somewhat aggressive themselves, or fast and agile swimmers. My piranha's have lost their color! Piranha's, like all fish, loose their body coloration during the night: they look drab and sometimes even sick. But you don't have to worry about that! When the piranha's are also less colorful at daytime, it can indicate a couple of things: the water quality can be bad (check the perimeters, and take appropriate measures), or the fish may be stressed (overcrowded tank, too bright tank lights, not enough hiding places...) or even sick, in which case you should determine what's wrong as quickly as possible, to be able to take the necessary steps to treat the fish in time. Can I add smaller piranha's to a shoal with larger specimen? In general, people will say that adding fish more than about 2 inches smaller than the already present fish will probably end up in disaster. This is not always the case, adding smaller piranha's can be done, but usually, the smaller ones are seen as potential meal, and are in danger. To minimize the risk, make sure there are enough hiding places, redecorate the tank prior to introducing the new fish, to break up existing territories, and keep your fish well-fed. But again: there is no guarantee it will work out!! !